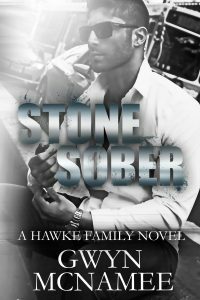 Stone Hawke is precisely the kind of man women are warned about—handsome, intelligent, arrogant, and intricately entangled with some dangerous people. I should stay away, but he manages to strip my soul bare with just a look and dominates my thoughts. Bad decisions are in my past. My life is (mostly) on track, even if it is no longer the one to medical school. I can’t allow myself to cave to the fierce pull and ardent attraction I feel toward the youngest Hawke. Nora Eriksson is off-limits, and not just because she’s my brother’s employee and sister-in-law. Despite the fact she’s stripping at The Hawkeye Club, she has an innocent and pure heart. Normally, the only thing that appeals to me about innocence is the opportunity to taint it. But not when it comes to Nora. I can’t expose her to the filth permeating my life. There are too many things I can’t control, things completely out of my hands. She doesn’t deserve any of it, but the power she holds over me is stronger than any addiction. The hardest battles we fight are often with ourselves, but only through defeating our own demons can we find true peace.